William Jennings Bryan "Billy" Herman (July 7, 1909 – September 5, 1992) was an American second baseman in Major League Baseball (MLB) during the 1930s and 1940s. He was known for his stellar defense and consistent batting. He still holds many National League (NL) defensive records for second basemen. Born in New Albany, Indiana, in 1909, Herman attended New Albany High School. Herman broke into the majors in 1931 with the Chicago Cubs and asserted himself as a star the following season, 1932, by hitting .314 and scoring 102 runs. His first at-bat was memorable. Facing Cincinnati Reds pitcher Si Johnson, Herman chopped a pitch into the back of home plate, which then bounced up and hit Herman in the back of the head, knocking him out. A fixture in the Chicago lineup over the next decade, Herman was a consistent hitter and solid producer. He regularly hit .300 or higher (and as high as .341 in 1935) and drove in a high of 93 runs in 1936. 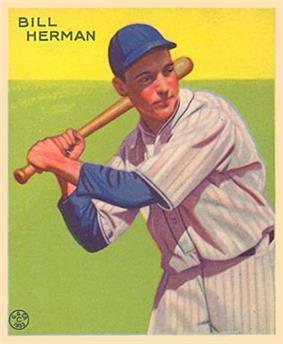 After a sub-standard offensive year in 1940, Herman was traded to the Brooklyn Dodgers in 1941. He had one of his finest offensive season in 1943, when he batted .330 with a .398 on-base percentage and 100 runs driven in. Herman then managed in the minor leagues and became a Major League coach with the Dodgers (1952–57) and Braves (now based in Milwaukee) (1958–59)—serving on five National League pennant winners in eight seasons. Then he moved to the American League (AL) as the third-base coach of the Boston Red Sox for five years (1960–64), before managing the Red Sox to lackluster records in 1965 and 1966; his 1965 Boston club lost 100 games. After his firing by the Red Sox in September 1966, he coached for the California Angels (1967) and San Diego Padres (1978–79) and served in player development roles with the Oakland Athletics and the Padres. Herman finished his career with a .304 batting average, 1163 runs scored, 47 home runs, 839 RBI, and 428 strikeouts. He won four NL pennants (in 1932, 1935, 1938, and 1941) but no World Series championships as a player (although he was a coach on the 1955 World Series champion Brooklyn Dodgers). His record as a Major League manager was 189-274 (.408). Herman holds the NL records for most putouts in a season by a second baseman and led the league in putouts seven times. He also shares the Major League record for most hits on opening day, with five, set April 14, 1936. Herman moved to Palm Beach Gardens, Florida in 1968. He was inducted into the Baseball Hall of Fame in 1975. He died of cancer in 1992. Herman's granddaughter is Cheri Daniels, wife of Indiana Governor Mitch Daniels. ^ Mackin, Bob, "The Unofficial Guide to Baseball's Most Unusual Records", Greystone Books, 2004. ^ "Billy Herman, 83; Ex-Cub and Dodger Was Hall of Famer".